Automatic Knife Positioning can reduce downtime, improve accuracy and generate cost savings. Efficiency is one of the keys to staying competitive in the converting industry. 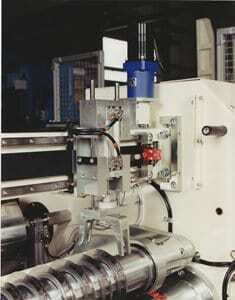 Slitter rewinders have several features that can be added to increase efficiency and reduce downtime. One such feature is automatic knife setting. Automatic knife setting in broad terms is a servo powered positioning system that moves and places the slitting knives (score, shear or razor) across the width of the web path to create the desired slit width. These systems are fast and accurate. When compared to manual knife setting, where the operator unlocks, measures, positions and locks the knife into place, the savings can be substantial. The average skilled operator would likely be able to do this in 10-20 seconds per knife. With an automatic knife positioning system, the time would average between 3-5 seconds per knife depending on the slit width. This would be a substantial time savings for runs that require a large number of knives. For shear slitting this is especially true, as both male and female knives would need to be positioned. Using a dual axis positioning system, both male and female knives would be positioned simultaneously reducing setting time even further. These systems improve accuracy and consistency allowing the slitter rewinder to produce slit widths with tighter tolerances. This has created opportunities for our customers allowing them to provide more tightly tolerance finished product. In addition to the time savings, the operator is now free to perform other duties required for the next job such as changing the parent roll, unloading the finished rolls, or packaging. Here at Elite Cameron, we regularly equip slitter rewinders with automatic knife setting which come standard with recipe storage and full integration to the touch screen HMI for rapid recall and ease of use. Our customers have found these systems to be a highly effective and very beneficial.